"Delicious simple dessert inspired by Thai cuisine! Exotic and flavorful, this is a family favorite! Great after a chicken curry meal!" Combine the rice and water in a saucepan. Bring to a boil, then cover and reduce heat to low. Simmer for 15 to 20 minutes, until water is absorbed. Mix the desired amount of sugar into the hot rice. Portion the rice into 4 bowls. 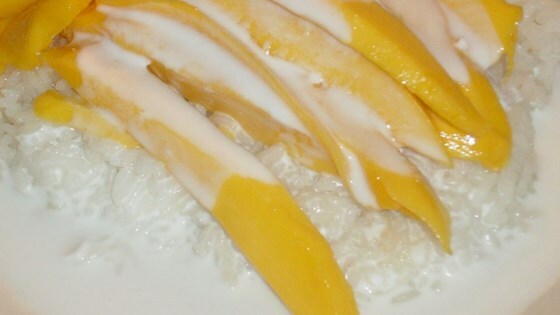 Top with mango slices, and pour some cream of coconut over the top of each bowl. I really like this recipe. Very easy to make. I used my rice cooker. I put 3/4c. of rice and 1/2c. of sugar. Letit cook all together. This is a really light desert! Great for summer time. Perfect! Just like the restaurant. I tried some of the suggestions from other reviewers, so make sure you read them!!! Delicious, just like the sweet sticky rice I've had in Thai restaurants. Very easy to make. I LOVED this recipe! I did use brown sugar because I ran out of white. I served it as dessert after salmon burgers, and it was the talk of the table. This is a good easy way to do this desert. I love this no matter how it's cooked and I'm a chocolate person--you should try this!